The dining room table is one of the central places in any home. After the sofa, the dining table is the second most important furniture you will buy for your home. It is where everyone in the family meets to have breakfast, lunch or dinner. It is also used by guests. The dining table is an important part of your home’s decor. Dining tables can either be made of wood, glass or other materials. A large wooden dining table brings a traditional charm into your dining room. Dining tables made from hardwood posses durability, toughness, and longevity and can give you a grand dining experience. There are many wood options for the dining table. The tables can be made from oak, maple, walnut or cherry. With these many options, how do you choose the right one for you? Let’s look at the features of each type of wood. Oak possesses a good density and hardness and has a natural texture you can see and feel. It is very good for making dining tables because it is resistant to dings and dents. If you have young children in your home, a solid oak dining table is best for you. Maple has a tighter grain than oak. It has a smooth texture which gives it a silky look. There is the brown maple and hard maple. The brown maple is lightweight and absorbs colored stains well unlike the hard maple, which is denser and handles stains poorly. The hard maple is priced higher than the brown maple. Both are suitable for formal or everyday use. Walnut is not as hard as oak but is harder than brown maple. The wood has dark to light patterns that give it a sleek look. Most urban types of décor use walnut. It is priced higher than other woods. Cherry has smooth grains and is softer than other hardwoods like oak. It darkens on exposure to light. Its softness makes it more prone to dents. However, it still gives a beautiful charm to your dining room. Your wooden dining table can take any shape you want depending on your dining room design and the size of the room. If your dining room is long and narrow, you should opt for a long rectangular dining table which is the most common. You can push the table closer to the wall and use only one side, or you could place it a little away from the wall to use both sides. Square dining tables are best if your dining room is a square space. You can also use a round wooden dining table set in a square space to accommodate more people. A roundtable gives you room to add as many chairs as you need. 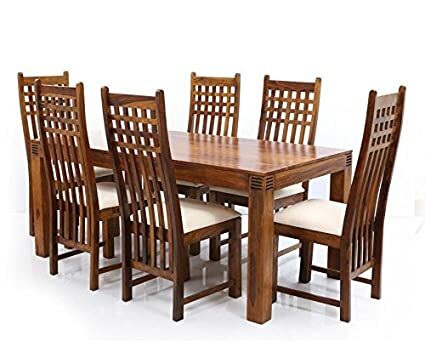 Having the right set of wooden dining table can give your dining room a modern look. There are stores that sell wooden dining table online. You can select your preferred style and purchase from these stores.